Some of the finest homes built were originally installed with steel Crittall Windows. Whilst many people have opted to change these windows with standard upvc or aluminium, the reputable window company working with the well informed customer will recommend that a suitable aluminium Crittall Replacement Window System is installed to replace old windows. This is a sector Total have been involved in for many years and are well regarded professionals in the supply of Crittall Replacement Windows. 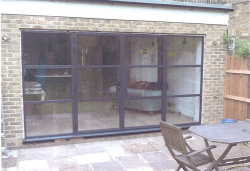 However when it comes to replacing old steel Crittall Doors, the consumer has not had the wide choice available with window installation companies often opting to replace old steel doors with standard residential aluminium doors. Total Installations are one of the first companies in the UK to manufacture the brand new Smarts Alitherm Heritage Door which has been successfully installed in a refurbishment project in Colliers Wood, London. The new Smarts Alitherm Heritage door has been designed to replicate original Crittall Steel Doors. The Smarts Evolution door is a brand new product and we were delighted to be involved at this early stage in the manufacturing process. This new door system is unbelievably slim and has the additional advantage of being able to be manufactured in very wide door leaves far surpassing what can be achieved with standard aluminium residential doors. Many aluminium manufacturers shy away from Crittall Replacement Windows and Doors owing to their complexity in manufacturing especially when they are required with face applied aluminium bars. This can be a labour intensive operation for most window factories, but here at Total we have been making such windows for many years and are happy to offer the new Smarts Door where other fabricators may not. This new product does an excellent job of replicating old Crittall Doors and offers our trade partners a real competitive edge if they have customers replacing their windows and being concerned that they could not find a door to match. We believe that the new Smarts Alitherm Heritage door will also be a hit with Local Authorities in conservation areas where there are strict rules in place in the replacement of old windows. Additionally this new door has impressive U Values of 1.8 W/m²K when installed with a suitable specification double glazed unit having warm edge spacer bar, low E glass and argon fill. We are able to offer this new Crittall Replacement door unglazed or glazed to the trade in all the RAL or Syntha Pulvin colours including the Smarts Sensations textured powder coated range.